Austrian regulators have decided to legally clear the way for hoverboards. Today happens to be October 21, 2015, the day Marty and Doc time-traveled to in 1989’s Back to the Future Part II. 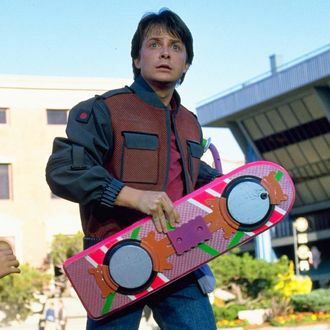 Though hoverboards haven’t become commercially available yet, several firms have produced hoverboard prototypes similar to Marty McFly’s rocket-propelled board from the film. These are very different from the two-wheeled faux hoverboards that Justin Bieber scoots around on sometimes. Vulture also took a look at where the rest of the Back to the Future technology is in real-life 2015.